It all started with a dozen eggs and a free helium balloon. One summer morning two years ago, I made a quick trip to the grocery store to buy a dozen eggs. We had run out while making cookies for the bake sale that my three daughters and the neighbor kids hold during our annual garage sale, which was scheduled for the next day. As I checked out, a kind grocery store clerk offered each of my kids a helium balloon. The only problem was that the balloons were different sizes and colors, and my youngest daughter, who received the smallest and plainest one, felt shafted. By the time I buckled her car seat, she was in full meltdown mode. Over a complimentary balloon. When we arrived home, I immediately took her to her room to calm down, but she continued to flail and seethe and steam. As if on cue, downstairs in the kitchen my other daughters had spontaneously combusted into a fight about whose turn it was to crack the eggs. Someone had spilled a box of cookie mix onto the counter and floor. Raw egg dripped down the side of the island. All three kids -- one upstairs, two downstairs -- were yelling simultaneously, creating a suffocating echo chamber of irrational chaos and distress. For a moment, I remained calm and tried to create order. I tried to diffuse the situation and separate them, but my youngest had freed herself from time-out and reinserted herself into the kitchen's fray, like an aggressive pro-wrestler who taps back into a Battle Royale. Defying basic principles of acoustics, all three managed to be yelling louder than the others, each nonsensical in her own rage, each pushing every last button of my composure and good judgment. And that's when I snapped. I don't entirely remember why the microwave door was ajar (softening butter for the bake sale cookies, perhaps? ), but for one moment, I fixated on that door. Or, more aptly, on slamming that door with every ounce of strength I possessed, which, after the fourth slam, I discovered, was enough to short circuit and break my microwave. My daughters were shocked into silence, looking at me as if I had finally lost my mind (which, for all extents and purposes, I had), and I spat out the words. "Go to your rooms. Now." They mumbled and pushed their way down the hallway and up the stairs, still bickering. I stood in the kitchen to survey the mess by myself. Feebly, I opened and closed the microwave door, hoping to coax it back to life, but it was dead. Clock-burned-out, no-buttons-working, no-hope-left, dead. I fumed. I fumed at the girls. I fumed at myself. I fumed because the average price of an over-the-range microwave is about $150, so I'd have to sell 300 stupid 50-cent garage sale items the next day just to dig myself out of the hole I'd dug. I walked outside to clear my head and saw my neighbor. "How's it going?" she called across the street. I reached her driveway and said, "I just killed my microwave." I smiled weakly and wiped my eyes as the emotions surfaced, "It was either that or the kids." She listened, hugged me when I finished, and said, "I'll send my husband over to look at it." A minute later he arrived to assess the damage. He opened and closed the microwave door a few times, peered inside, pressed buttons, then unplugged and plugged it back in. "Well," he said, "I don't see anything specifically wrong. Seems like the problem is internal." The problem is internal. You got that right, buddy. I had already reached that conclusion, in more ways that one. Oh, I had plenty of internal problems under the surface. The rest of the day I was off. I finished baking the cookies. I priced the remaining garage sale items. I interacted with my kids. But my equilibrium hadn't returned. Each time I glanced at the microwave to check the time, a practice that I do far more often than I realized, the blank screen stared back as a reminder of my short temper and stupid reaction. 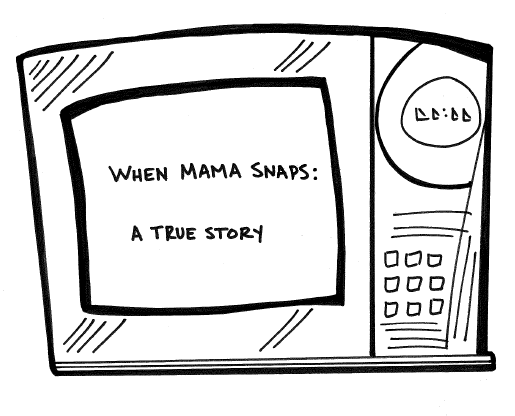 I had majorly screwed up in motherhood more than once before this microwave incident, of course, and I've screwed up plenty of times since, too. When I've been pushed and stretched and tested, I've done and said things I wish I could take back, just like every other mother who's walked this earth. But this particular time especially stung. The broken microwave was a visible reminder of my shortcomings, as if my inability to control my own anger nullified any teaching I had done to help my kids handle their own. More profoundly, the incident forced me to confront a latent (yet terribly incorrect) assumption I had been holding. Subconsciously, I thought that if I lived a moral and godly life in front of my kids, that they'd grow up to be alright. That if I set a good enough example as a Christian parent, then they'd grow up to be kind, rationale, and balanced humans who walk closely with God. And, if I didn't do these things, then they'd essentially be screwed. This is a foolish belief, though. It doesn't work this way. We don't draw our kids (or anyone else, for that matter) to Jesus just by living morally in front of them. Raising godly kids is not about us being perfect parents. It's about pointing our kids to a perfect God. Raising godly kids is not about us being perfect parents. It's about pointing our kids to a perfect God. That night, after unsuccessfully attempting to reheat a plate of leftover Chinese food, and still more habitual glances toward the dead microwave to check the time, I tucked my kids into bed. One by one, in the stillness and quietness of their darkened bedrooms, I apologized to my daughters. Each apology broke the tension; each hug brought restoration. My youngest daughter reached toward me, tenderly putting her small hand on my cheek, and said, "Mommy, it's okay. I love you." My middle daughter apologized in return, saying, "We were really, really bad. We're sorry." And my oldest, after hugging me, stopped me as left her room. "Mom?" her voice spoke from the dark. "This is just an idea, but you might want to keep the broken microwave in the garage. You know, in case you get mad and really need to slam something again." I told her that I'd keep the option open. We live flawed lives in front of our kids, but thankfully, the flaws rarely are fatal. We can model restoration and repentance for them. Through our own mistakes, even the ones we're deeply ashamed of, we can teach our kids what it looks like to apologize. We can teach them about the sweet and freeing reconciliation that comes when we take ownership of our wrongs and seek forgiveness -- both from God and from those we've hurt. Our children will make plenty of mistakes in their own lives, after all. What better way to show them how to make those wrong things right than to let God work his redemption through our very own failures? Because maybe one summer morning 30 years from now, one of my daughters might be holding a garage sale and run out of eggs while baking cookies. And she might break her own microwave when her own children have rubbed her last nerve raw. And, at that point, she'll know just what to do.